Use the warm up as a tool to improve your running experience. Good reasons to stretch and tips on how to do it effectively. Injuries slow millions of runners each year. 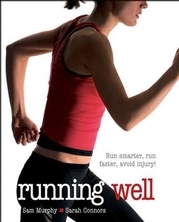 Running Well provides you the solution to prevent injuries, improve technique, and treat any ailments that occur. Featuring full-color anatomical art, you can pinpoint causes of common injuries and learn how to minimize your risk, so you reach the all important finish line faster and healthier. Sam Murphy is one of the United Kingdom's leading fitness and health experts, contributing to Health and Fitness, Healthy Living, and Financial Times. She is the author of five books, including Run for Life, which has been published in 10 languages. Murphy is a training consultant to the London Marathon, Nike, and Adidas. She is a regular speaker at conventions and conferences on fitness and health. With over 17 years of experience as a runner, Murphy has raced distances from 3,000 meters to 100 miles and is a 14-time marathon runner. Murphy lives in Clapton, London, and enjoys running, walking, and camping. Sarah Connors is a physiotherapist who specializes in running injuries. She is the physiotherapist for the British athletics team. Connors has worked with British athletes since 1993 and attended two Olympic Games. She has been a competitive runner since the age of 11. Connors is married with three children and enjoys running, skiing, and spending time with her kids. "A well-written, beautifully illustrated book that manages to find just the right balance between the science and the spirit of running." "It is absolutely fantastic. I always refer to it and I have recommended it to many."